Body Choir is a new musical interface that allows the user for being a choir by himself. The body postures and movement control parameter of real-time harmonizers. 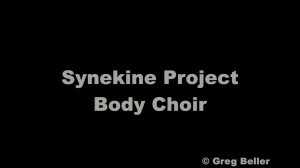 The body of the singer provides choir parameters such as the number of voices, the delays between voices, the man vs. female ratio, but also musical parameters, such as tonality, tension of the chord progression or directly notes of the accompaniment. ℗ Where am I ?